MotorSpeak: F1 Car vs Le Mans Car: Who Wins? Have you ever seen a Le Man car in action? If you've ever looked at images of one up close you'll see that this obtuse lumbering oddity is in fact an amazing piece of cutting edge technology. When you see the level of attention lavished on each carbon fibre element you could be forgiven for thinking that it seemed to share the same workings of an F1 car but with a different suit on. And I don't mean in a road-car way. I mean in a "this car could have a serious go at showing an F1 car how it's done" kind of way. Which brings me to the title of this blog, just how far apart/close are these two spheres of motorcraft? F1 and Le Man cars are conceived and born in totally different manners and yet the ultimate difference between the two is remarkably small. A Le Man car is designed to go extremely fast, for up to 24 hours at a time and usually designed for just one circuit, namely Le Mans. When you count up the cost of the R&D, manufacturing and overheads of such an operation it seems even more expensive next to the already ludicrously expensive F1 series. An F1 car is designed around a much tighter set of rules (such as wing lengths and tyre types), is the result of a progression from previous designs in F1 seasons and are expected to last for up to 2 hours around a variety of global circuits. So which is faster? For those of you expecting an upset, I'm sorry. The F1 car is in real terms faster. Around a twisty track the F1 car will run rings around a LMP (Le Mans Prototype). However; the one saving grace for the LMP is that it probably has a higher top speed than an F1 car and could also run at higher revs for a longer period. A track with a good mixture of straights and turns is the beloved Spa Francorchamps Circuit in Belgium so a look at the lap times from there would be useful. 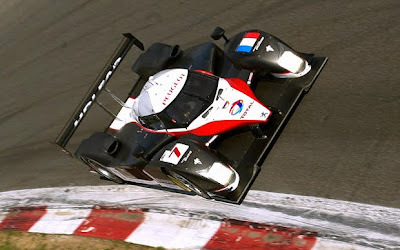 The Pole time at this year's Le Mans Series was set in a Peugeot 908 HDi with a time of 1m 57.884s. The Pole time at this year's F1 race was set by Mark Webber's Red Bull at 1m 45.778s and that was set in a borderline wet conditions. So that's a difference of around 12 seconds, how? Before I go into the details let's not forget that being 12 seconds slower than a state of the art F1 car around a long circuit is not to be sniffed at! The LMP cars weigh more and have less power which effects acceleration, cornering and braking. Le Mans cars also prefer not to overstretch the engine for endurance events and will therefore have less wing to ensure less revs on the straights. So there you have it folks: An F1 car is indeed faster than a Le Mans car but it would not last long in an endurance event. Who knows, perhaps in ten years time when the F1 law makers tighten regulations up even further (smaller engine capacity, grooved tyres etc.) we may see the day when the mighty Le Man car can match an F1 car for pace as well as endurance! Interesting Blog John: we've borrowed this one for our site! thanks! not much to wallow on. for having to read the entire article, the only truly relevant pieces of information were the comparative lap times and the fact that F1 cars are lighter and more powerful and will therefore by the laws of physics obviously be quicker. the fact that a le mans car can race for 24 hours is irrelevant, all we want to know is their comparative quickness around a track. the reason i was always interested is because open top, open wheeled race cars are less aerodynamic compared to the slippery 250mph le mans cars, forgetting the mammoth rear wing, but remove that and an f1 car is thought to easily breach 250mph. what i've always been interested in is what would be possible if they designed a le mans style car, designed to compete over short periods and not require the endurance spec engine allowing for heightened revving and a lighter body. basically a hybrid of the two cars. that would be a sight to see. Interesting take! However, something's missing here: what type of event are we talking about? If it's a 300km Formula 1 race, yes a F1 would win against a LeMans car. However, if considering 24H Le Mans race, that's a whole different story! Why? well, in one season, a F1 car runs for 20 races, each race being around 300km, for a total of 6,000km. The 24H Le Mans is slightly less (around 5,500km). HOWEVER, a F1 car uses up to 8 engines to cover these 6,000km, EIGHT! Any F1 participating in a Le Mans race would very well... until its engine fries like a sausage on a barbecue.